You may ask why should we encode to M3U8 format on Mac OS X El Capitan. This owes to the advantages of M3U8 format. First and foremost, it’s fast to drag the video. There is no extra datas and no need for buffering. In other words, you can drag the video to any point for smoothly playing immediately. What’s more? The original supporting effect is good. To ensure smooth video stream, how to convert video files to M3U8 format on Mac OS X El Capitan? You cannot usually change a file extension to your terminal format like M3U8 and expect the newly renamed file to be usable. An actual file format conversion using the method below must take place in most cases. Use a file conversion online service or software program to convert video files to M3U8 is a good idea. Here Pavtube Video Converter for Mac is highly recommended. This program is preferable because it’s both easier and will probably result in a more accurate file conversion. How to encode video files to M3U8 on Mac OS X El Capitan? Step 1: Download and have a quick installation. The trial version will have a watermark on your converted files. Except for that, there are no time limitation, no virus, and no unnecessary bundle apps while downloading. After that, click “Add Video” button to load your source video files. You can load several files at once thanks to “Add from folder” button. Step 2: Click the “Format” bar to get the drop-down menu and you can get “HLS Streaming (m3u8)”. 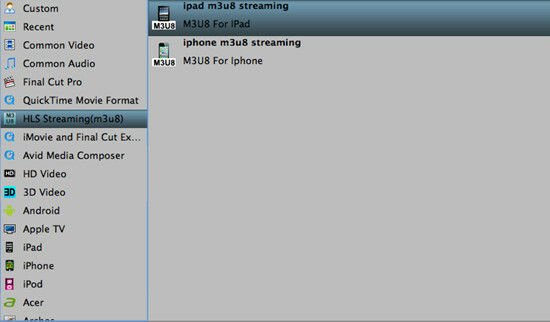 Choose “ipad m3u8 streaming” or “iphone m3u8 streaming” as best output format. These are not limited for iPad/iPhone output use. Any media player supporting TS format are all available for playing M3U8 format files. Conclusion: The output files should be named without space and file path should be in plain English or pure digital, or you couldn’t play them successfully. After conversion, you can set up a server to enjoy M3U8! Hope this M3U8 encoder for Mac OS X El Capitan review can do you a big favor. If you are Windows users, you can refer to Top-ranked M3U8 Converter for Windows Reviewed. How to Play a Torrent File in Windows Movie Maker?